Volt Resources Limited (ASX:VRC) Namangale Pre-Feasibility Study (PFS) testwork has produced an exceptional graphite concentrate product for the Lithium-ion battery market. Excellent metallurgical results from both the Namangale 1 and 2 deposits that make up the majority of the JORC Resource at the Namangale Project have been received. Volt Resources Ltd (ASX:VRC) ("Volt" or the "Company") is pleased to announce that it has appointed EAS Advisors LLC ("EAS") as its North American corporate advisor. Located in New York, EAS is a boutique global advisory firm that was founded by Edward Sugar in 2008. Volt Resources Ltd (ASX:VRC) is pleased to announce very positive results from the initial Pre-Feasibility Study (PFS Stage 1) work on its Namangale Graphite Project in Tanzania. Volt Resources Ltd (ASX:VRC) High Quality Concentrates Produced and JORC Resource Upgrade at the Namangale Project. 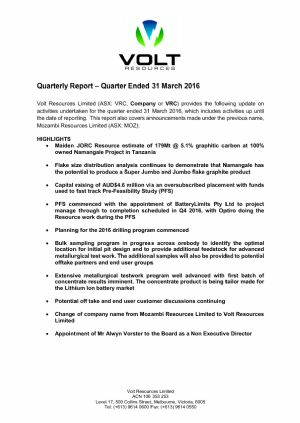 Volt Resources Limited (ASX:VRC) provides the following update on activities undertaken for the quarter ended 31 March 2016, which includes activities up until the date of reporting. 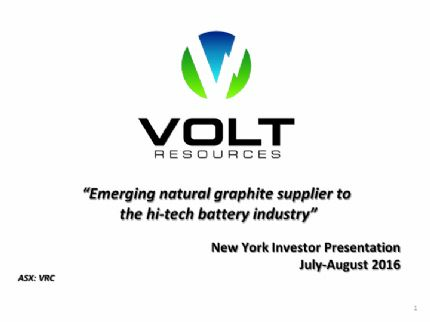 Volt Resources Limited (ASX:VRC) is targeting to become a preferred supplier of high quality large flake graphite to the emerging high technology industry. 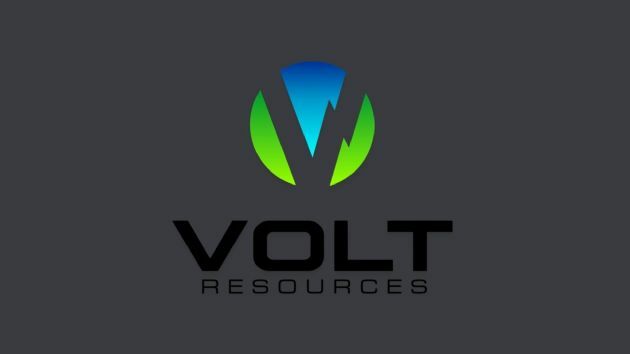 Volt Resources Ltd (ASX:VRC) the Tanzanian-focussed graphite developer, is pleased to announce the appointment of Mr Alwyn Vorster as an independent Non-Executive Director, effective 1 April 2016. 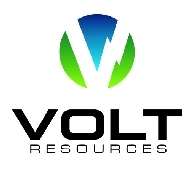 The Directors of Volt Resources Ltd (ASX:VRC) present their report on the Consolidated Entity consisting of Volt Resources Ltd (the Company) and the entities it controlled during the half-year ended 31 December 2015. 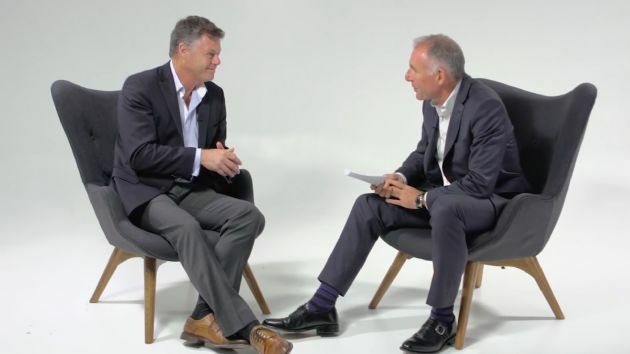 FINANCE VIDEO: Volt Resources Ltd (ASX:VRC) Corporate Overview. Tanzanian graphite projects have tended to be lower grade but larger flake size. Discoveries in Tanzania are centred around the Townships of Nachingwea and Mahinga. 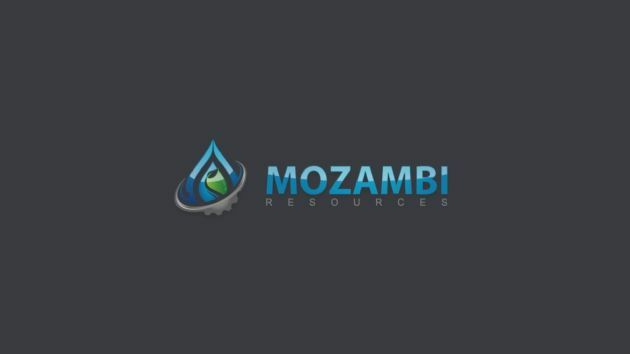 Volt Resources Ltd (ASX:VRC) In an interview with Chairman Stephen Hunt, James Lush asks about the opportunity for Mozambi with the Tanzanian high grade Jumbo Flake graphite that will be used in many new battery applications including energy storage and electric vehicles.